Publishing Genius Press needs no introduction here. We are always loving and writing about PGP books, from “modern classics” like Easter Rabbit by Joe Young and Pee On Water by Rachel B. Glaser, all the way to “instant classics” like Night Moves by Stephanie Barber and Fun Camp by Gabe Durham. PGP is like the utility infielder of small-press literature: it can play any position (genre) reliably and look good while doing it (design). Except with also hitting lots of home runs, home runs with titles like Light Boxes and Meat Heart, if home runs had titles, which in this metaphor they do. Nor does PGP company man Adam Robinson need an introduction. He writes for here. Here at HTMLGiant, we are always loving his body. Ho-oh-ho but have you heard about his awesome Kickstarter called “Publishing Genius 2.o?” And have you seen the viral Mr. Rogers-style video of Adam wearing a dashiki? And did you hear they (he? we?) shot over halfway to the $10,000 goal in less than a week because people love PGP and want it to live as long as we both shall live? 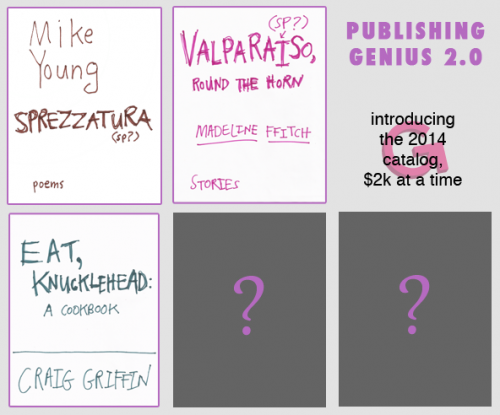 AND AND AND at every $2000 benchmark, Adam will reveal one of the 5 books that will be released in 2014. AND DID YOU KNOW THERE WILL BE A CONTEST RIGHT HERE RIGHT NOW because we love contests and giveaways at HTMLGiant, so much so that there’s already been one today! Here’s how this will go: YOU GIVE MONEY to the Kickstarter because of how much you want Publishing Genius to thrive as it launches into its “2.0” stage, or for whatever reason. THEN MAKE A COMMENT HERE indicating that you’ve done so. Then, when the Kickstarter is 24 hours from being over (Sep 10 @ 7:47 pm), I will draw a name from the list of (contributing) commenters (I can easily verify whether you really gave up the dough. I have Adam on speed dial), AND (if you win) I WILL DOUBLE-MINT YOUR REWARD PRIZE. Meaning, whatever level you gave at, I personally will double so you get double-mint the reward (or its equivalent). I will even round up. So, for example, if you give $60 for an E-Book Subscription (hey, smart choice! ), I will contribute enough to bump you up to $125 level where you will have your choice of those rewards (pending availability). OR, if you give $1, for thanks and your name listed, I will contribute another buck and your name will be listed TWICE and you will be thanked doubly in Adam’s heart, once in each ventricle. GET GIVING. Don’t forget to comment here!